We are updating all our contacts. If you would like us to keep in contact with you, please let us have your contact details. Pick up a post card from the back of church, or complete the form on line. You can now check whether the New Hall or the Old Hall is available on our web site. Simply go to www.stpetershighfields.co.uk/halls for a full calendar. We will also update prices and booking terms and conditions on line. You will then be able to phone and provisionally book. Payment can be made in cash or debit card (in person or over the phone). The scaffolding is, at last, slowly being removed from the tower and revealing some of the work .. There is still some work to do. The turret, which sits on top of the spiral staircase, is all being replaced. Each stone is cut individually to form a beautiful waterproof top. The new stone will quickly weather, but is crisp and clear compared to the old stone – which has been in place for almost 150 years. However, all the stone has been worked by qualified stone masons in the same way. This work has been funded through the hard work of the congregation, the generosity of the communities we serve and through support from Heritage Lottery and Leicester Diocese. This week (week starting 19 March 2018) the clock returned – or rather, the completely refurbished clock faces returned. They look fantastic and they have been hoisted up ready to be fixed into place over the next few days. We hope and intend to get the clock working again, but the mechanism does need some tender love and care. Unfortunately, the pigeons had made their home in and around the mechanism, and they were not the tidiest of guests. But nevertheless, the clock faces and hands will look resplendent, and the clock mechanism will be coaxed back to life ready to tell the time to Highfields once again. The photo’s show the last of the clock faces being taken off the lorry and raised up ready to be fixed into place. St Peter’s Parochial Church Council has received a grant of up to £195,600 from the Heritage Lottery Fund (HLF) Grants for Places of Worship to continue the repair of their beautiful Victorian church and to develop volunteering and heritage learning for local schools. St Peter’s is required to raise a further £15,000 funding over the next few months to support the work. Consecrated in 1874, Grade II listed St Peter’s Church is an important part of the heritage of Highfields, one of the most diverse and disadvantaged neighbourhoods in England. The Church remains in urgent need of repairs and is listed as a Priority A on the Historic England Heritage at Risk Register, and Category A on Leicester City Council’s Heritage at Risk Register. The Parochial Church Council will now be able to start repairing the church roofs, focusing on the areas most in need of attention. Carrying out the roof repairs on the side aisles and part of the Nave roof will leave the church weather-tight and will allow the PCC to extend heritage learning with local primary schools and increase the community use of the building. The work will include removing asbestos from the areas concerned. A programme of HLF and Diocese of Leicester funded stonework repairs to the church tower is currently nearing completion, which will enable the roofs to be repaired without the risk of further damage. For over 140 years St Peter’s Church has stood at the centre of its community as a symbol of stability in midst of constant change and development. It has become the spiritual home of the Caribbean Anglican community, the place to where the community always comes at times of need. Google have recently flown over St Peter’s and Highfields and updated their aerial photos of the area. The shots of the church and halls show how impressive the scaffolding is, and also show (for you who are interested) the new roof on the top of the tower. The work has been funded by Heritage Lottery and Diocese of Leicester. You can see more Google images of the church and Highfields here. In many ways, the last few months have been frustrating. We know that work has been ongoing – we see and talk to the stonemasons regularly; they even join for lunch sometimes. Yet most of the work is shrouded in scaffolding. So it was great to receive an update from Smiths of Derby on how the clocks faces have been repaired, renovated and now painted. They are ready to be reinstalled as part of the finishing work on the tower. Here they are in the workshop, resplendent in their new colourings. Work to repair stonework on the tower of Grade II listed St Peter’s Church in Highfields has started, thanks to a grant of £158,900 from the Heritage Lottery Fund and support from the Diocese of Leicester. 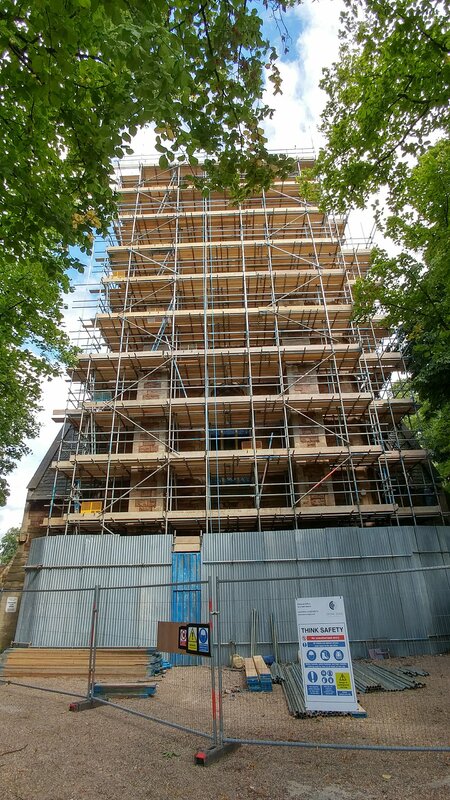 The mammoth job of erecting the scaffolding to the 26 metre high tower has now been completed and the repair of the crumbling stonework can begin. The tower stonework repairs and associated repairs to tower roof, tower windows, the clock face and internal repairs to the tower stairs are being undertaken by specialist Historic building restoration contractors, Stone Edge, and will be completed in February 2018. The Project also includes heritage learning activities with local primary school pupils and oral history recordings on video. St Peter’s Church will be open to the public during the Heritage Open Days on Friday 8th September (11.00 am to 4.00 pm), Saturday and Sunday 9th and 10th September (12.30 to 4.00 pm). As the building works continue, and we pray for further good news and a break through in our fund raising, the Church Community has been reflecting and reviewing what we do, and how we may go forward. We are now embarking on a major review of the gifts and skills God has given us all, and how we might use those to serve God better through the work of the Church. To that end, we all being encouraged to complete a questionnaire. If you want to, you can complete the form online below, print it off from this link, or pop into the church and pick a copy up.